SECUR FORCE has always distributed Protectron services. When this company changed hands in 2014, we continued our association with ADT, the leading security provider in the country. We, therefore, offer our customers a superior level of quality and an inventory of advanced products and services that adapt to all types of homes. SECUR FORCE has always been a Protectron distributor par excellence in Quebec and Canada. This number # 1 Quebecer in the residential and commercial security industry has changed hands for the tidy sum of CAD$555 million. Canada’s first home security company, ADT, bought Reliance Protectron Inc. (the second) in July 2014 for CAD$555 million. 2011 Protectron launched its commercial services (interactive). It has then been possible to check a business through video remotely. 2010 The year 2010 marked an important change: the company allowed its customers to remotely control their alarm systems with home automation. This service added an interactive feature for existing and future customers. The company acquired VOXCOM Security Systems. In doing so, Protectron acquired 140,000 new to its 200,000 customer base. Protectron serves a territory extending to central and western Canada. The company went into partnership with « Reliance Comfort Limited Partnership» to benefit from financial risk reduction and shared services. Protection One fell into the fold and expanded the 40,000 strong customer base of Protectron. These clients were primarily located in British Columbia and Ontario. New addresses in Vancouver, Toronto, and Ottawa were reaching customers from Ontario and western Canada. This year marked the company’s revolution of the security market and established a formidable reputation among the population. Wellspring Capital Management LLC acquired Protectron. This development made Protectron #1 in the country in the security industry. The company experienced impressive growth in both the commercial and residential sectors, and at the beginning of the year 2000, its customer base exceeded 100,000. During this period, a few known companies, including « Security 24 Monitoring Network », a company in Ontario, joined them. Protectron was established in 1988. Its headquarters located in Montreal offers security services across Quebec. With 800,000 customers in Canada, ADT offers sophisticated and varied services to help protect your home or business. This company has been around for a long time as it was established in April of the year 1874! When a break-in precipitated a reaction from the famed American District Telegraph, everything started. ADT was born, the fruit of the labor of its founder Edward Callahan. At the time, with a network of 50 call centers, our antecedents did not suspect the magnitude of this revolutionary idea. 50 years later, ADT created the first monitoring center to offer customers a way to protect their homes at all times. When Reliance Protectron Inc. was purchased by ADT, the company became THE solution for residential and commercial security in Canada. Thanks to technological developments and home automation, ADT allows its customers to leave their homes without worrying about security. They can control every aspect of their home through a smart device. Therefore, the alarm system, remote monitoring, lighting, heating, air conditioning, water heater and more are at your fingertips. Why choose SECUR FORCE for your security system? SECUR FORCE distributes the products and services of ADT, the # 1 company in residential and commercial security in the country. Our customers benefit from the expertise of a company that is more than a century old and serving more than 800,000 subscribers. Whether you need an alarm system for your main home, a secondary home, your apartment or even a shed, do not hesitate to contact us. Our tailor-made solutions by qualified specialists (technicians and advisors) will allow you to sleep with peace of mind. Connect your surveillance cameras to a robust and experienced network. Be on the lookout for intruders that can attack your home in real time with intuitive applications. Remember, we represent ADT, the #1 security company in North America. Innovative and reliable products that bring peace of mind to your family. Security services linked to the best ADT monitoring station in the country. A professional and attentive team with certified technicians. 9 branches at your service (Montreal, Quebec, Trois-Rivières, Sherbrooke, Gatineau, Laval, Lévis, Chicoutimi, Brossard). An industry leader in Canadian standards for almost 20 years. A member of CANASA (Canadian Security Association). We know that security is one of the biggest concerns of Canadians. Count on SECUR FORCE who distributes Protectron products and services. Maintain full control of your home with state-of-the-art technologies and multiple detectors all linked to a modern security system. These devices can be linked to a remote monitoring station to increase the effectiveness of emergency services. Detect any intrusion with these detection devices. These detectors will warn you of the presence of an intruder. Always on the lookout for problems that may arise in your home, these agents stay alert day and night, 24 hours, 7 days a week. Don’t let the opening of doors and windows go unnoticed. Prevent these silent killers from catching you by surprise with these handy devices. When opening a door, an identifiable tone will notify you. It is important to inquire about prices and fill out the short form on our page. 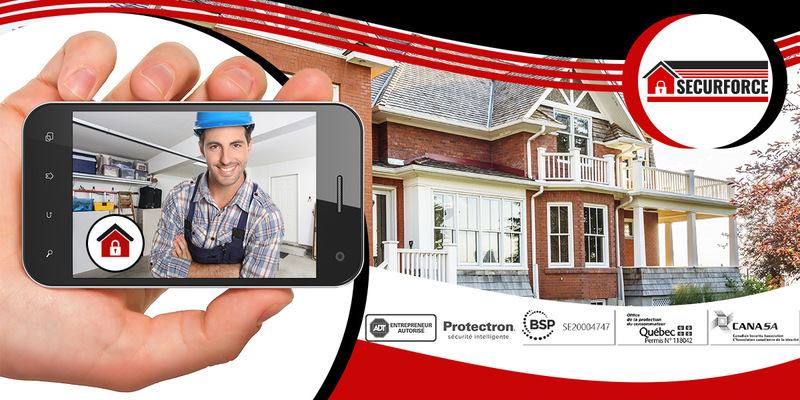 Protectron offers fixed packages for monitoring services for a period of 5 years with a free home security system. Uses your home phone line. All sensors and devices work wirelessly. Without the need for drilling holes in your walls. Free equipment with monitoring agreement. Certain conditions apply. This option provides you with security without paying for a landline. The level of security is higher because the line cannot be cut by a burglar. Even if a burglar destroys the keypad, the signal will still be received by ADT. With our interactive applications, you can arm and disarm your security system with your smartphone at no additional charge. To get a quote for an alarm system with these components, contact one of our advisors. Discover the cost and benefits of an ADT monitored security system to protect your loved ones. Take a few minutes to fill out our form, A FREE estimate of the project will be provided by a specialist. If you have any questions, don’t hesitate to contact him for clarification.